Family Engagement Centers – The newly enacted Every Student Succeeds Act (ESSA) includes the Statewide Family Engagement Centers (SFEC) program, which provides competitive federal grants to statewide organizations to promote and implement evidenced-based family engagement strategies. If the SFEC program is funded, applications for these competitive grants can be submitted to the U.S. Department of Education by statewide organizations such as non-profits or by groups of statewide organizations that have demonstrated involvement in engaging families in their child’s education and experience working with state-level agencies, communities, organizations and schools on family engagement policies and practices. Unfortunately, neither the House nor Senate included this important line item in their annual budget. It is not to late to have this key item funded but to accomplish our request we need to make our voices heard. PTA is asking Congress to Pass the 2017 Omnibus bill that would fully fund these important centers. Please take a few moments to send a letter to our members of Congress. You can quickly send your letter by clicking here. The fall semester is picking up speed, so it’s time for a math checkup! 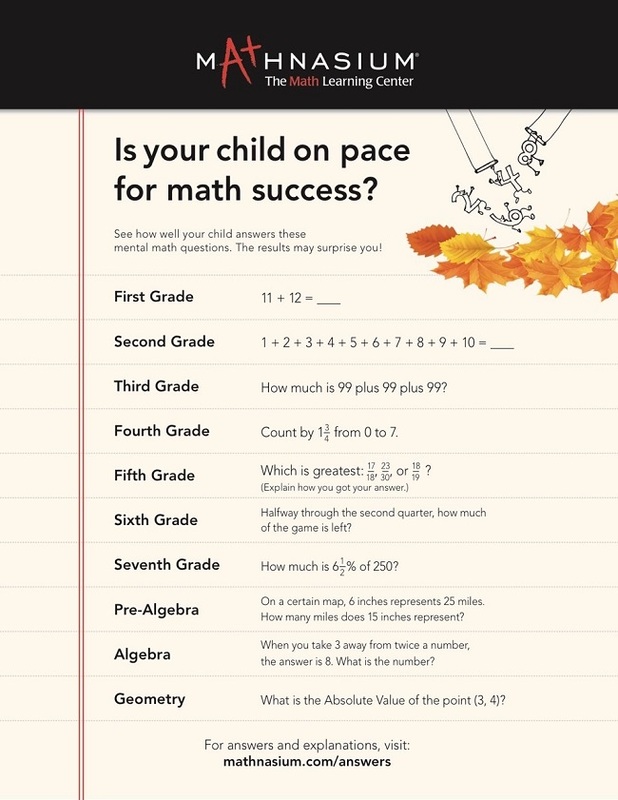 Can your child answer our grade-level mental math questions below? As a parent and PTA member, set your child on the path toward math mastery by presenting them with enrichment opportunities, while raising money for your local school! Hosted at participating locations Nov. 5 and Nov. 6, Mathnasium’s Annual TriMathlon is a free community math competition for all students in grades 2-5. Kids flex their math muscles in a fun and lively atmosphere where every child wins a prize just for participating—with extra special accolades and prizes for first, second and third place winners! Plus, Mathnasium will make a $10 financial contribution to community schools and PTAs for every student who participates! Learn more about this exciting neighborhood math contest by reading our TriMathlon FAQs. Then, head over to MathnasiumTriMathlon.com to try out some practice problems and register for the TriMathlon in your community! Whether students are ahead of the curve, performing at grade level, or falling behind, Mathnasium is here to help them reach their math goals. Find your neighborhood math experts to get started! Mathnasium is your neighborhood math-only learning and enrichment center. As one of National PTA’s four foundational partners for the STEM initiative, we’re proud to be the “M” in STEM! The Mathnasium Method extends beyond homework help and tutoring. Our students work through personalized learning plans that encourage them to cultivate number sense: a deeply intuitive understanding of how numbers work. As understanding grows and math foundations strengthen, kids approach math and learning with renewed enthusiasm and soaring confidence. The annual Drive Smart Teen Digital Short Contest sponsored by CTIA Wireless Foundation launches today. Students can enter a digital short educating others about the dangers of driving distracted for a chance to earn a $10,000 scholarship! National PTA is now accepting nominations for the 2017 Advocacy Awards! The deadline to submit a nomination is Sunday, Dec. 18. If you know of an outstanding youth or individual PTA advocate, or a local unit or state PTA that has done great advocacy work, nominate them to receive an award for their efforts from National PTA. You can also nominate yourself! Nominations must be for efforts made in the last year. Winners will be announced in January and will receive their awards at the 2017 Legislative Conference in Washington, D.C.